We rarely get to see tuned Infiniti models. But now that band has got its feet grounded in the green continent, we will be seeing more and more of them. 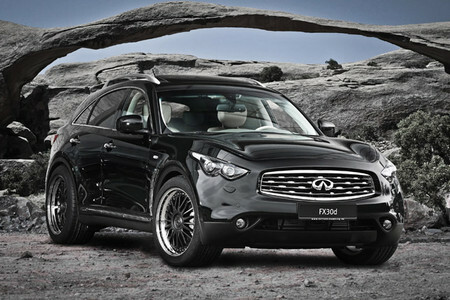 Like this one from AHG Sports based on the Infiniti FX30d. The diesel-powered crossover has been given a fresh new look by the German tuner with the Schmidt Revolution CC Line three-piece blacked-out wheels. They come in size 11J x 21” fitted with 295/40 ZR21 tires and cost near as makes no difference 8,00 euro. To complement the wheels they’ve also fitted the car with sport springs that lower it by 25 mm. Upon request they can also chip the engine and raise the power to 280 Nm and 600 Nm of torque.